Sorry this is so late. It was unfortunate that the forums were hacked again on the eve of September. Now that we're up and running again, please feel free to comment on these maps! For this month's "Maps of the Month" featurette, I wish to draw your attention to FlyingArmor's Paladin's Quest (Super NES) maps. It's time to start a new semester at school. Maybe even a magic school. No, I'm not talking about Hogwarts. I'm talking about the Magic School in Lennus, you know, the one next to the Tower of Gabnid that houses an evil being named Dal Gren, and if you release it, well, you might as well get moving because it's time to save the world. Such is the scenario of Paladin's Quest. Though it plays like most 16-bit RPGs, it looks considerably different than most. Firstly, the palette is different - you don't see the green forests and brown or grey mountains like you might expect from other entries in the genre. Nope, now you've got blue tress, green or purple mountains, and smatterings of pink everywhere. Round trees, egg-shaped buildings, and pod-shaped treasure chests give the game a very unique style. FlyingArmor, a (relatively) new mapper here, has begun a mapping career on VGMaps.com with maps of Paladin's Quest so you can see for yourself, if you haven't played this game before. And all of the items that can be found are clearly indicated, so these maps make the perfect guide if you do want to explore the world of Lennus. This debut effort is certainly worthy of the Maps Of The Month status. 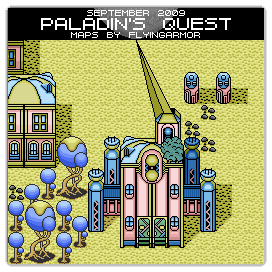 So to recognize the effort put into mapping this stylistically unique (but somewhat obscure) RPG, FlyingArmor's Paladin's Quest maps will be known as VGMaps.com's Maps of the Month for September 2009. This sure took me by surprise when I saw it on the front page last week! I don't think I would have ever bothered mapping this game if it weren't for a nifty patch I discovered many years ago that allowed for walking through obstacles, among other things. Yes, being able to use "Walk Through Wall" type codes makes mapping games much easier. There are several games I have mapped before other games I might have normally decided to map first due to having codes. Fortunately the NES has the FCEUX emulator with a great built in code search feature allowing me to find many codes useful for mapping a game. The last thing you want to do is worry about dodging enemies when you are trying to get the screen in a specific location to take a screen shot. I'm still hoping someday someone comes out with an emulator for the SNES that has as many features as FCEUX has for the NES. The art for this game looks a little weird. Kind of MSPaint-ish. If that's a way to describe something. Happy Birthday, DarkWolf! You have a little cake in your profile. For the next few games I want to map (Lufia and Lennus II) I'm going to have to find a way of "discovering" GG codes so I can map them fully. It's been rather frustrating whenever I looked in save states to find that there was barely any map data outside of what was visible for gameplay. But I think I'll figure it out if I'm persistent enough. Yeah, the look and feel of Lennus is really out of this world, eh? If you think the landscapes and areas look alien, you should take a look at a lot of the monsters in the game. Oh, was it ever fun, heheh. As I got close to finishing all the areas, I was wishing there would be more to do. And while I'm at it, best of birthday wishes, DarkWolf!